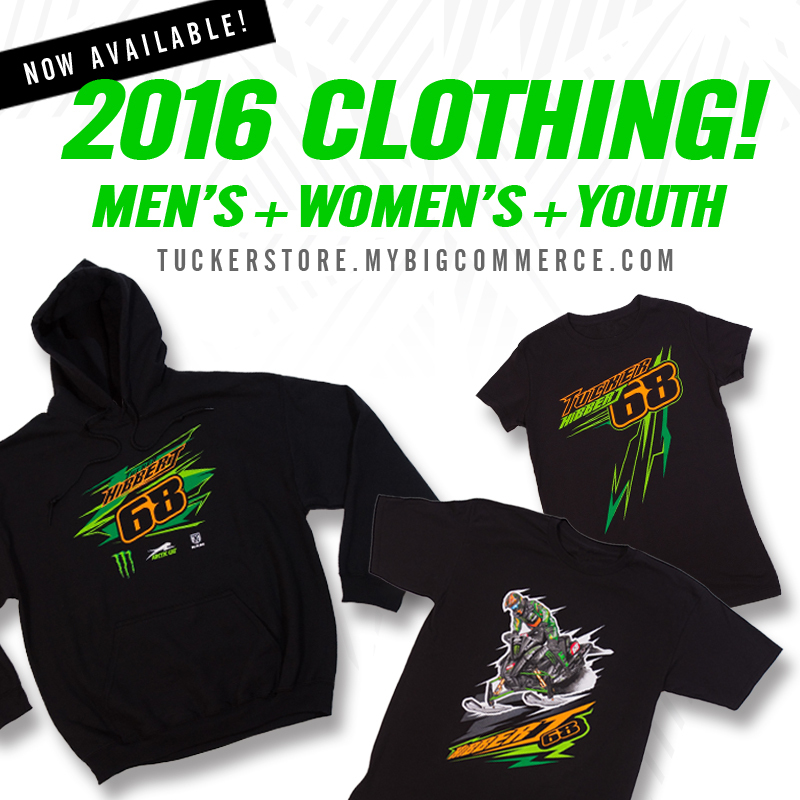 Just in time for Christmas, Tucker Hibbert’s 2016 merchandise is now available! Men’s, women’s and youth clothing along with accessories are stocked and ready to ship. Christmas Shipping: To receive domestic shipments by Dec 24, orders must be placed by 12pm (CST) December 21. 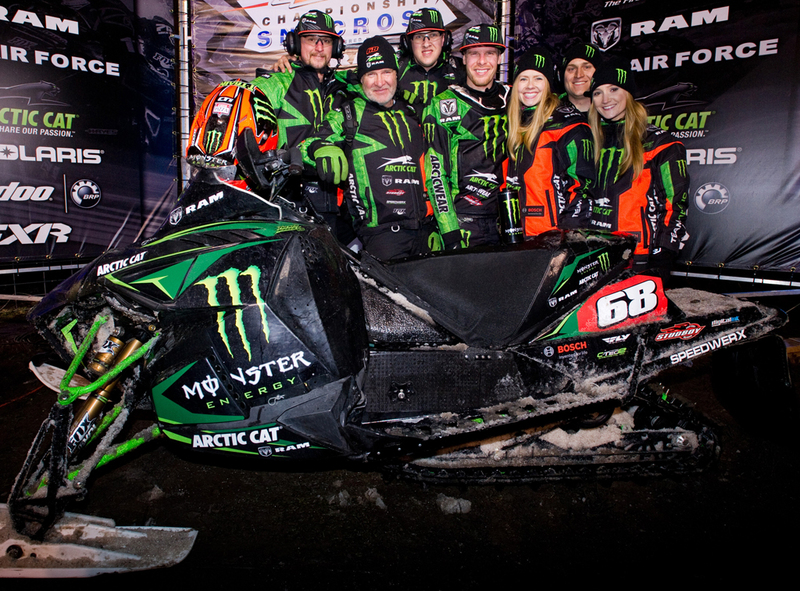 Monster Energy / Arctic Cat / Ram Truck’s Tucker Hibbert took a win at his home race Saturday night in Glyndon, Minn. Battling unseasonably warm temperatures, Buffalo River Race Park had little snow to work with for the Fargo National but pulled together a small, sloppy sub 30-second racetrack for rounds three and four of the ISOC National Snocross tour. Hibbert went 1-2 in his qualifying rounds Friday night, making him the number one qualifier for the final event. With ISOC’s new inverted start procedure, he was awarded the final spot on the front row of the 15-rider start line. He got a solid jump but immediately backed off to avoid getting pushed wide in the tight, first corner of the track. Finishing lap one in 11th place, he spent the next 19 laps making passes on a near impassable track to finish fourth. Saturday, with track conditions continuing to deteriorate, Hibbert struggled in qualifying. Known for his ability to move through the field on any track, he had a hard time making passes while battling poor visibility from the heavy, wet snow roost. Getting out front early in the final would be key to take the top spot of the podium that night. In the 15-rider, 26-lap final, he rounded the first turn in third place and avoided getting collected in a collision on the front stretch that took out the front two riders. With a clear track in front of him, he pushed hard to cushion his lead early before getting into lappers. Riding smart, he held on to take his 110th pro national win. Hibbert has a three-weekend break before hitting a busy swing of races in January. For more information on his schedule, visit tucker-hibbert.com.